Three times a year the Curriculum Committee receives approximately 100-130 course proposals. These proposals, which are pdf documents, must be reviewed for conformity to specific standards and format before submission to the OLLI director for his review. The Data Manager receives the proposals, reviews them and uploads them to an OLLI website. ​The Data Manager must have technical computer skills, be attentive to detail and willing to work under strict time constraints. Approximately two weeks each term (early August, early December and early May) are required for this major and very important OLLI function. Throughout the year the Data Manager will be in contact with the Curriculum Committee Chair to discuss timeframes and possible updates to the forms and process. The OLLI you know and love flourishes in large part because of its volunteers and its Board of Advisors who advises the Director concerning the curriculum, activities, and the general operation of OLLI at Duke. We need you to help us recruit nominees for Vice President and two Members at Large who will play an important leadership role in making our program robust and vibrant and in shaping the future of OLLI at Duke. The Vice President serves for one-year and Members at Large serve for 2 years. Descriptions of the responsibilities of these positions can be found here. While OLLI members will elect new officers and at-large directors in the Spring, the nomination process starts now. Traditionally we seek candidate board members who bring a love of life-long learning and share our enthusiasm and commitment to take us to the next level. We seek members who have participated in classes and social activities, have a willingness to learn more about OLLI and share their observations and ideas, and are eager to team with others to help make OLLI even better. Who are the interesting people you have met in classes or at events, such as a museum tour, who could be a great candidate for one of these board positions? Encourage them, or yourself, to consider this opportunity and get their permission to be nominated. Nominations can be submitted by filling out the Board Nominee form for each candidate you would like to nominate. The deadline for nominations for Vice President is January 1, 2018. The deadline for nominations for Member at Large is February 15, 2018. Questions? Contact the Nominating Committee chair, Sara Craven, at nominating@olliatduke.org. Please join us in wishing success to our newly elected Board members! With elections now complete, the Nominating Task Force will be inactive until Task Force appointments are made by the Board President for next year’s election. I want to thank my co-members for this election cycle, Mike Bahnaman, Wendell Musser, and Marvin Teer, for their efforts on behalf of the Board. Gregg McPherson, President of the Board of Advisors has provided our latest Annual Report on the health of OLLI at Duke. As I complete my second (and final) term as President of the OLLI at Duke Board of Advisors, it is my pleasure to report to the membership that our lifelong learning organization continues to grow and improve. Through the dedicated efforts of hundreds of volunteers as well as our excellent Duke staff, OLLI at Duke remains one of the premier Osher Lifelong Learning Institutes in the country. We are in great shape. What follows are more details regarding our past year. Seated, from left : Garry Crites (Director), Betsy Bullen (At Large), Stephanie Johnson (Volunteer Relations), Ginny Knight (Curriculum), Margaret McKeon (Membership). Standing, from left: Mike Bahnaman (Instructors Relations, Recording Secretary), Marvin Teer (Vice President), Gregg McPherson (President), Charles Squalante (At Large), Raymond Conroy (Communications), Margaret Riley (At Large). Not in photo: Wendell Musser, Mary Ellen Walkama. Thanks to Carolyn Leith for these photos taken during the Board meeting on April 25. ​In 2016, members continue to express an overall positive view of OLLI at Duke. The survey, conducted between January 20 and February 10, 2016 had a response rate generally in line with the 2012 and 2014 surveys. We received 777 completed surveys (from a membership of 1,949) for a response rate of 39.9%. This is high enough to have some confidence in the findings of the survey. ​ I want to thank OLLI board member, Mike Bahnaman for creating and tabulating the survey for the third successive time. Demographics: Like most OLLIs across the country, we have a 2:1 female:male member ratio. Sixty percent of our members are age 60 to 69. A few folks less than 60 make up about 3% of the population and the remaining 37% are 70 and older. As for the length of association with OLLI at Duke, 22% of us have been with OLLI for less than a year. Those who have been with us between one and four years make up 42% of the membership. Finally, those with five or more years of membership constitute the remaining 36% of the membership. We are seeing a slight trend for all these numbers to be shifting towards a shorter time in OLLI as compared to 2014 data. Overall Satisfaction: Almost 90% of our members continue to feel that they were Somewhat Satisfied or Very Satisfied with their experience at OLLI at Duke this year. This has not changed since the last survey in 2014. On the opposite end of the spectrum, 7% of respondents said they were Somewhat or Very Dissatisfied. This is one percent higher than the 2014 data. When asked another way, 89% of us felt our OLLI experience this year was the same or better than last year. 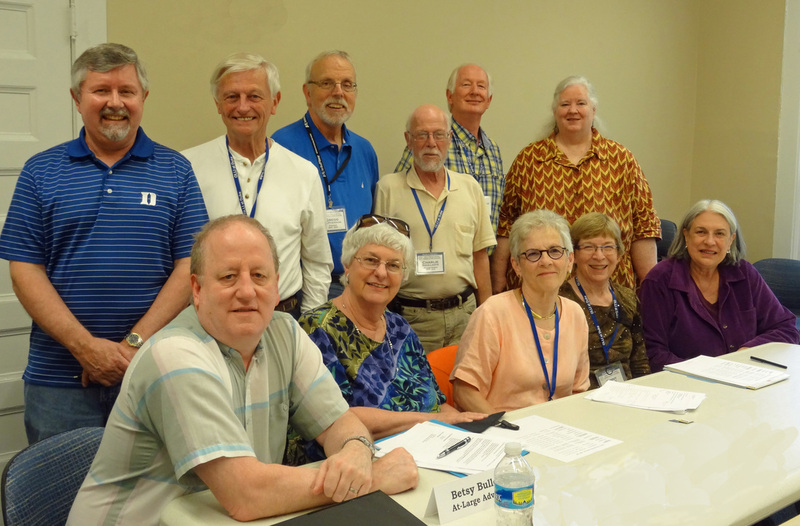 OLLI Courses: OLLI at Duke remains focused on the classroom. Almost 95% of members take OLLI courses and these courses are the most important reason why people belong to OLLI at Duke (97% of us listing this as the reason for joining). Over 85% of respondents thought their classes were good to excellent. People liked the variety of course, the course content, the course schedule, and the quality of instruction (all over 90% good or excellent responses). People were a little less enthused about the value for the money with 85% responding positively to this point, still highly positive. OLLI Activities: About a third of our members participate in OLLI-sponsored social activities – about the same rate as in 2014. Volunteering for OLLI: About three in ten of our members volunteer in some way for OLLI at Duke. The highest percentage cited was as a Class Assistants (17%). Other categories assessed were Teaching a Course (8%), serving on the Board or a committee (7%), or helping with an event or activity (6%). A little over 70% have not volunteered for OLLI at Duke in any category. Venues: Two thirds of our courses are taught at JRC and that is the preferred venue of most respondents (67%). Bishop’s House has its share of supporters but make up a much smaller group (20%). Registration: Most respondents (over 72%) register online but 27% of people felt it was somewhat or very difficult to use the system. This is only slightly better than the 33% response to the same question in 2014. As we know, getting into the class you want can be frustrating with 35% of respondents reporting that they were unable to get into the class they wanted. This is worse than it was in 2014 where only 22% had the same frustration. Computers and Social Media: We are computer-using crowd. Virtually all members (99.6%) have a computer, smart phone, tablet, or all the above. About two-thirds of the respondents told us they use social media, primarily Facebook. The usage is rising as a little less than half used social media in 2014. Feedback: Many of you took the time to provide written comments and we thank you for your input. Many of the comments centered on familiar themes: parking issues, inadequate space (especially at the Bishop’s House), registration woes, and courses or instructors that were inadequate. Each board member read the quantitative results as well as every comment from the survey. We are in ongoing discussions on how to address the concerns you have expressed. You will be hearing more about new initiatives and plans as the year progresses. Summary: OLLI at Duke is in good health but it is not perfect. We celebrate our strengths: the overall satisfaction of members, the volunteers who participate, and the rich array of activities we are providing. But we also are actively working to improve in the areas that were less well received such as our wait lists, registration difficulties, and facilities shortcomings. OLLI at Duke is a cooperative organization that depends on us all pulling together to make it into the best OLLI it can be. We remain committed to that goal. Thank you again for your participation in the 2016 Member Survey.